The GooglePack is a software developed by Google to keep your computer with updated software for several areas, such as web browsers, antivirus, photo management, and Google earth, to mention a few. Using the GooglePack, you will have a much better time in keeping your computer protected against viruses and spyware. The software automatically looks for updates for these important software categories, and applies the updates whenever necessary. The GooglePack also comes with cool programs to make your life simpler: the Google Desktop offers search capabilities similar to Google Search for your desktop. Google Desktop looks into any file, finding the content of the file, and constructing a database of words that you may be looking for. Other cool software includes Google Picasa (to keep your photos well organized), and even a screen saver, that can be used to show your pictures on the desktop, while adding nice effects. The Google pack can be easily configured. All data and information is available online. In the following steps you will see how it is easy to configure and use. You can maintain the pack up to date using the Google updater feature. 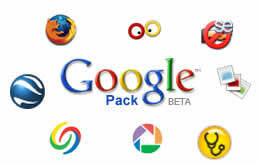 The Googlepack is divided into two categories: Google programs (Google earth, Google Picasa, Google desktop, and IE toolbar, plus the new Google screen saver), and third party programs (Firefox, Norton antivirus, Acrobat reader, and Ad-ware SE). Google Pack Features: this article gives more detailed information about the Googlepack. Check it and see the contents of this nice set of programs.